Want to get a first hand glimpse of a net-zero energy home that generates all its necessary power from renewable energy? You may get a chance if you live in one of the areas that the Living Zero Home Tour is traveling through. Starting just a week ago in Chicago, the Living Zero Home Tour is showcasing a net-zero energy home featuring energy efficient appliances and building technologies. The home will continue to travel through November so you can experience and see for yourself how energy efficient technologies are integrated and how they can easily lower monthly utility bills as well as your reduce environmental impact. A number of sponsors have gotten together to build and promote the house including, All American Homes, Planet Green, GE, Engenuity Systems, State Water Heaters, Wyndham Hotel Groupand Insignia Electronics by Best Buy. They have built a Zero Energy Home (ZEH), which has been designed and constructed to produce more energy than it consumes on an annual basis. Typically ZEHs are grid-connected and feed power into the grid when it is producing more energy than it is consuming. Contrariwise, the home takes from the grid when it needs more power than it can make. But over a year’s time, the home will produce more energy than it consumes. This particular home generates all of its power from photovoltaic panels on the roof made by GE Brilliance Solar Power. Only with the help of all the other energy efficient technologies and appliances can the home be net zero though. 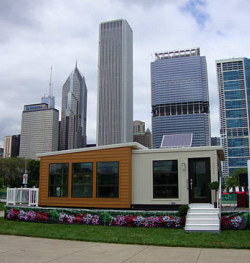 The modular home was built in a factory to minimize construction waste and also includes a Smart Living System that monitors energy as well as other systems to help alert the homeowner to any potential problems like a leak, clogged filters, excessive energy use, or malfunctions. 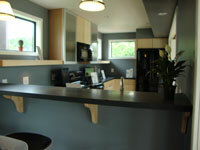 All the kitchen and home appliances are Energy Star Rated and supplied by GE. The counters are by EcoTop Counter Surfaces and are made of FSC certified fibers made of a 50/50 blend of bamboo. All the electronics were provided byInsignia, which is the exclusive brand from Best Buy and are Energy Star Rated. Windows and doors are high performance fiberglass made byPella and Therma-Tru. Other energy efficient products include Icynene foam insulation, Sea Gull Compact Flourescent Lighting, Solatube Daylighting Systems, and a Comfort-Aire Heat Pump. Hot water heating is provided by a tankless and on demand State Water Heater, along with water efficient faucets and shower heads by Delta. 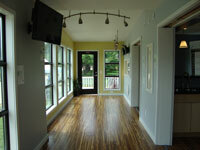 And lastly the home was painted with Sherwin Williams zero VOCs Harmony line of paint. The tour will travel through 16 cities in the United States and concludes in Denver, CO in late November. Click here for exact cities and dates. Let us know if you get a chance to see it as it travels the country. Also if you go visit the home on it’s tour, you enter the Living Zero Home Tour Sweepstakes for you chance to win a 42″ Insignia flat screen LCD Energy Star Rated Television, a GE Energy Star Rated Refrigerator or a GE Profile Energy Star Rated Dishwasher.